Advocate Marketing is a great tool to increase social engagement for your event, but how do you keep your event posts from getting lost in people's news feeds? 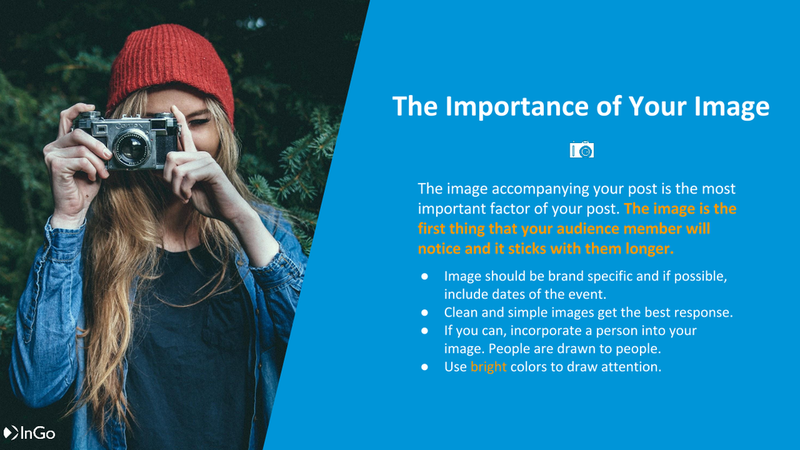 Follow these tips to optimize the effectiveness of your InGo posts. Note: Click on each image below to see more detailed descriptions of each tip. Your image is so important to getting noticed. It should be clean, colorful, and clear. ad:tech New Zealand did a great job with an eye-catching image. Your image should be brand specific and if possible include the dates of the event. Clean and simple images get the best response. If you can, incorporate a person into your image. InGo images should be 1024x512 pixels. It is best if text can be centered on your image. 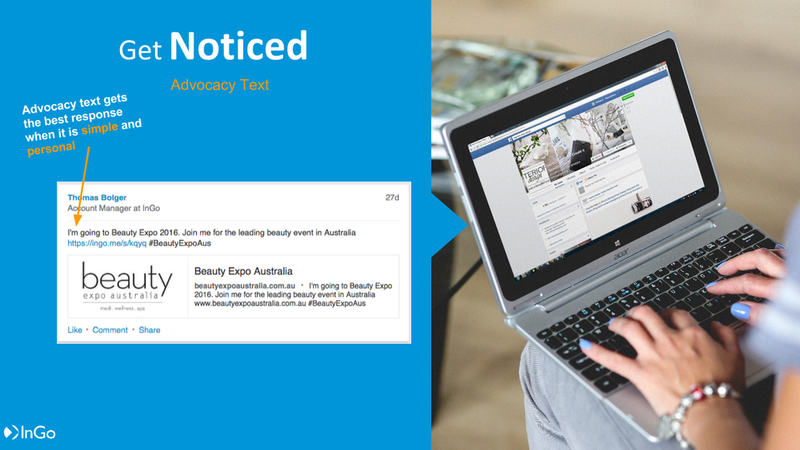 Your advocacy text should proclaim what makes your event different and keep your audience in mind. Mention whatever sets your event apart. Use special codes, contests, or giveaways to increase engagement. Keep your audience in mind: is this something they would want to share or just something you'd want to share? BDNY mentioned what set their event apart. What makes YOUR event stand out? Use simple and personal advocacy text. Because Twitter will sometimes remove your image, you want to make sure your text is simple and clear on its own. Advocates do more than just grow an event; they reach millions of people in a trusted, personal way. Make sure to empower your advocates with posts that create the best engagement. Sometimes it is hard to keep up with all the new trends and fads, which can be especially true when it comes to social media. There is a new social network or app coming out daily, for example have you heard of Boomerang yet? It is important that you not only keep up with social media on a personal level so your friends don’t think you’ve been living under a rock, but on a professional level as well to help your organization grow. When it comes to the events industry, social media can be used on multiple levels to increase registration, communication and engagement. According to the GWI Social report, on average people are actively using 4 social platforms. That allows for multiple touch points with your attendees and you have to find a way to reach them on these platforms. Most people would look to social media purely for communication purposes, but what about for registration? Social registration is becoming a function that multiple registration providers are implementing in their software in order to meet the needs of their clients and their clients’ attendees’. Unsure what social registration is? It is the ability to register for an event or log into a website using a specific social media application’s user credentials. That means when visiting a website, they may give you the option to log in or register using your Facebook, Twitter or other social media IDs. There are many benefits to using social registration for your events, and we are going to go into them below to help you “get with the times” when it comes to event registration! You have probably seen multiple posts on the web on how to make your event registration process simple for attendees. Attendees hate when registering for an event takes them more than 5 minutes, and trust, me a lot of them do. You already have your attendees wanting to come to your event, so why do you make them jump through hoops just to secure their place? Social registration makes the process quick and easy. All they have to do is click the social media button that they want to sign on with, and the form will auto fill with the correct information. As an event organizer, you want to have returning attendees year after year, but you are also looking for new prospects to attend your event. That is where social registration can come into play. With tools like InGo, once your attendees register via their social media account, they will be able to share their excitement for your event through their news feed and personally invite people in their network that may be interested in the event! As an organizer this gives you access to a whole new audience. Again, using an app like InGo will allow your attendees to network with fellow event goers before the event. When they register socially, they will be taken to a page that allows them to see the social profile of other attendees. They can see who is already in their network, and also who isn’t but they would like to connect with. This is a huge bonus for attendees because they will be able to make connections before the event that will allow them to establish a relationship, so when the event comes it is easier to communicate with their peers. When someone registers for your event, you collect that social data and store it in your CRM or marketing automation system. This will help with future communication that you have with your attendees. By having them use social registration, you are able to store their actions and personalize the experience the next time around based on their social identity. People today own at least 1.57 mobile devices, which means a good chuck of your attendees are probably going to be registering for your event on a tablet or phone. Social registration makes the process a lot easier for them. If you don’t have a website that is optimized for mobile or even if you do, the social registration screen simplifies the process and they won’t have to try and type in those tiny forms. Not only is it easier to register, but research shows that more people are inclined to share when they are using their phones (probably because majority of people use social media solely on their phones.) This is great news for you, because your attendees are now more likely to invite their friends to your event or share that they are attending. Pre-event, you will be promoting all that is happening via social media. 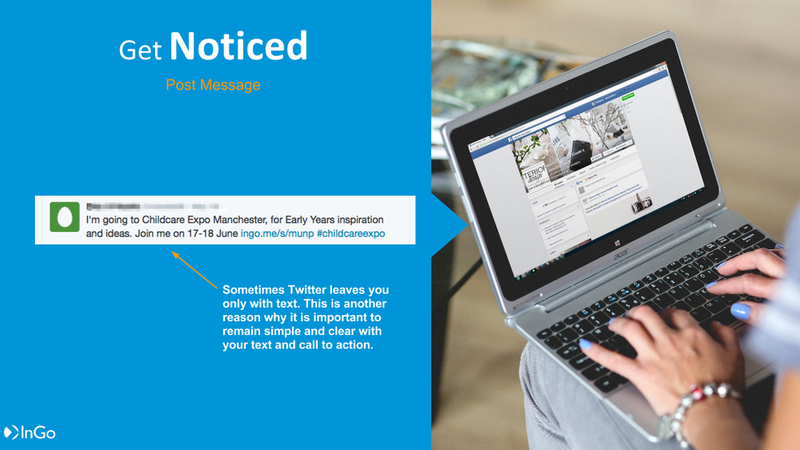 You probably have a hashtag for your event that you hope people are using to communicate. However, sometimes people forget to use it and that means that you are missing out on the chatter about your event. When someone uses the social sign-in option, you have collected the data for their social accounts and you are able to store this information. With your marketing or social media team, you can create a list of the accounts of attendees to follow pre, during and post event in order to see what they are saying about your event. This gives you the ability to respond to their feedback and to share their positive comments about your event. It is all about creating a community! Social registration is not only beneficial to make the process quick and easy for attendees, but it also helps with your event marketing efforts. Your attendees live on social media, so use that to your advantage. Give your attendees the simple process they are looking for, while at the same time increasing your event’s reach and ultimately growing your event community.